With Kegco's stylish new HBK309S-3, home-brewers can proudly dispense and serve up to three different types of home brewed beer at the same time! This triple faucet home-brew kegerator is packed with all of the same great features you love in Kegco digital kegerators, as well as a complete three-tap ball lock keg dispense system with everything you need to tap Cornelius ball lock kegs. This dispense system comes with exciting upgrades like a three-faucet stainless steel draft tower, premium double gauge regulator with air distributor, and glossy red 5 lb. aluminum CO2 cylinder at no additional charge for a value of $35! 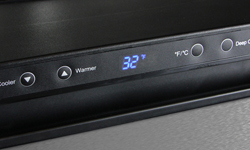 The HBK309S-3's intuitive digital functionality allows you to easily set and adjust the internal temperature by a single degree, view the temperature in Fahrenheit or Celsius on a clear LED display, or activate the Deep Chill function to cool down a warm beer keg - all with the push of a button! 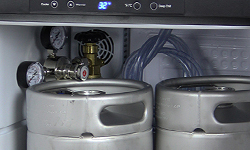 Fan-Forced cooling gives this kegerator one of the coldest temperature ranges of any beer cooler on the market today, and can be set as low as 32 degrees to dispense ice cold draft beer. 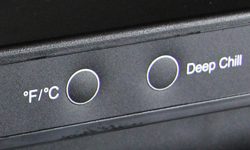 The fan helps to provide even cooling throughout the cabinet. Store and dispense up to three ball lock Pepsi kegs in the HBK309S-3's spacious interior, which can also be used to hold a 6-gallon bucket or carboy during fermentation. 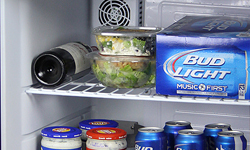 You can even use this versatile unit as an all-refrigerator to store food and other beverages! The HBK309S-3 comes with easy-rolling casters that make it possible to enjoy your home-brewed beer in nearly any room of your home! 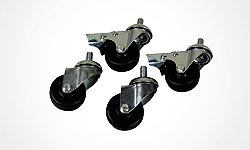 Once the keg dispenser is in position, the casters can be locked to ensure that it does not move again until you want it to. 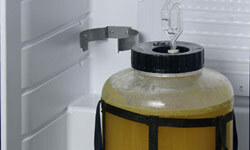 This Kegco Homebrew Beer Kegerator comes with everything you'll need to dispense up to three kegs of home brewed beer. The triple-tap dispense system features a polished stainless steel draft beer tower with three chrome faucets, an empty 5 lb. aluminum CO2 cylinder with glossy red coating, a double gauge CO2 regulator with air distributor, and three complete sets of ball lock home-brew keg couplers. * - Letting the Deep Chill function run for the full 24 hours may result in freezing of the keg.